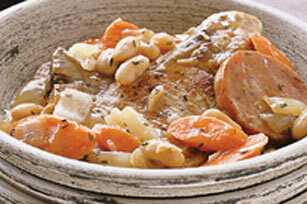 Enjoy our Quick Pork Cassoulet, a tasty alternative to typical comfort food dishes. This Quick Pork Cassoulet has pork loin chops, kielbasa, fresh veggies and tender cannellini beans. Heat oil in large skillet on medium-high heat. Add chops; cook 2 min. on each side or until browned on both sides. Move to one side of skillet. Add kielbasa, carrots, onions and garlic; cook 2 min., stirring occasionally. Add broth, bay leaf and thyme; stir. Cover skillet with lid. Bring mixture to boil. Reduce heat to medium-low; simmer 25 min. or until chops are cooked through. Stir in beans. Mix flour and water. Add to ingredients in skillet; mix well. Cook 5 min. or until thickened, stirring frequently. Remove and discard bay leaf before serving. Score the fat at 1-inch intervals around each chop to prevent it from curling. Always remember to remove and discard bay leaves from your recipe before serving. Since they don't soften during the cooking process, they result in an unpleasant mouthful.